Curl up with a crime novel from the golden age – the 1930s and 1940s. Reacquaint yourself with the kings and queens of the crime genre – and discover some fascinating lesser-known authors from this rich period. Brilliant book; was envious of Daniel and Elizabeth’s relationship. If you recently watched and enjoyed the TV adaptation of Agatha Christie’s ABC Murders, book now for this Essex Book Festival event. Sophie Hannah, who has written three new Hercule Poirot novels in the style of Christie, will be appearing at Maldon Library on Tuesday 5 March at 8pm. The Essex Book Festival 2019 box office is now open – so visit the Festival website or pick up a programme and explore this and all the other events. Book your tickets and make the most of our twentieth anniversary celebrations! The profile of Essex authors is rising, and at this exciting event you can get to meet over 50 of them! Drop-in to any of the three writers’ slams, where you can listen to 15 authors within just an hour. Or chat to them about their writing at Meet the Author sessions, and perhaps buy a book and get it signed. Essex Authors and You runs from 10am to 4pm on Saturday 9 March at Chelmsford Library. Entry is free, and you can come and go as you please. Thank you to all the book groups who applied to be part of the Book Group Symposium. If your group was selected you will have been contacted by now. But that doesn’t mean that your group can’t get involved! The Symposium will be at Chelmsford Library on Thursday 28 March and the two fantastic featured authors are Sarah Moss, whose latest book Ghost Wall has been receiving fabulous reviews, and Carolyn Kirby, debut author of The Conviction of Cora Burns. It’s a great chance to meet other book groups and share recommendations too! We think that Essex has more book clubs than any other county in the UK. As part of their month long Essex Writers House programme, in partnership with Essex Book Festival, Metal are hosting a mass gathering of Essex book lovers. They’d love you to read the short, classic text Animal Farm by George Orwell, before you come. If you’ve read it before, now is definitely the time to read it again and rediscover Orwell’s genius and just how pertinent “the greatest political fable” still is. And if you haven’t got time to read it – go along anyway – they’ll be performing a short extract that evening. The event will be held at the Essex Writers House Pop Up at Metal, Chalkwell Hall, Southend on Sea, on Thursday 21 March at 7.30pm. Tickets are free, but booking is essential. Book at www.essexwritershouse.com or call 01702 470700. Enter our latest prize draw to give your book group a chance of winning one of two sets of books. All you have to do is answer one simple question. 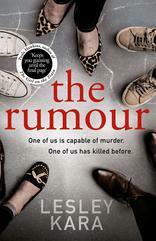 This month’s prize, kindly donated by Orion books, is The Rumour, by Lesley Kara. Lesley lives in Frinton and is one of the authors participating in our Essex Authors and You event (details above). Rumour has it that a notorious child killer is living under a new identity, in the sleepy little town of Flinstead-on-Sea. When single mum Joanna hears the rumour at the school gates, she never intends to pass it on. But one casual comment leads to another and now there’s no going back . . . The winners of the last issue’s prize draw were Shenfield Bad Mothers, Buckhurst Hill Book Talk and Essex IVC Book Group, Chelmsford. These groups have each won a set of The Craftsman, the thriller by Sharon Bolton. Congratulations to all and many thanks to Orion books for kindly donating the prizes!